Please note - these chairs are being sold as seen. They will need some restoration work before they can be used, and they will also need to be polished prior to use. Returns are not accepted on these items. 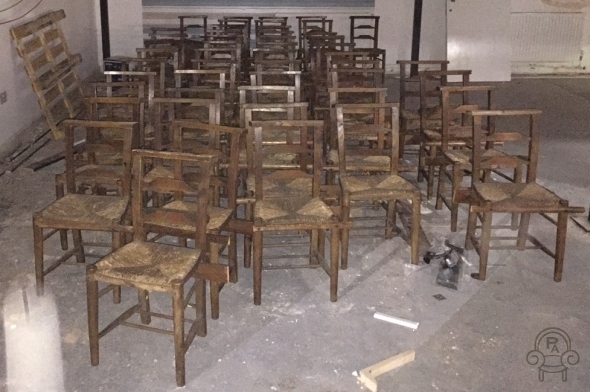 Job lot of 51 antique late Victorian rush seated chapel chairs. These chairs have been acquired from a large church clearance; they have a classic design, and feature slatted backs and a sloping bible shelf. The chairs have been used on a daily basis and they do show signs of wear and tear and a few small holes from historic wood worm. The chairs will need restoration work. These chairs are ideal for any restaurant, bar, cafe or even a large country kitchen. These chairs have now sold.